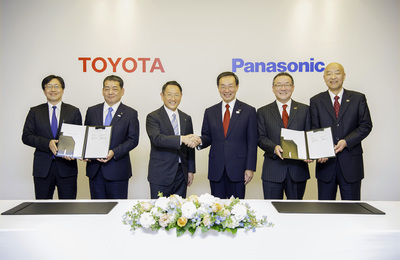 Toyota City, Aichi and Kadoma City, Osaka, Japan - January 22, 2019 - Toyota Motor Corporation (Toyota) and Panasonic Corporation (Panasonic) concluded today a business-integration contract and a joint-venture contract toward the establishment of a new company (joint venture) related to the automotive prismatic battery business. Signing of partnership agreement between Panasonic and Toyota. 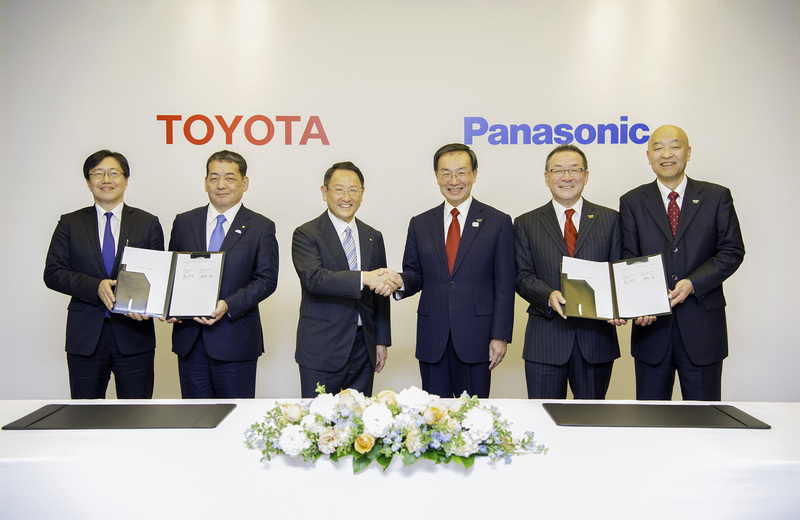 Toyota Motor Corporation (Toyota) and Panasonic Corporation (Panasonic) concluded today a business-integration contract and a joint-venture contract toward the establishment of a new company (joint venture) related to the automotive prismatic battery business. The details of the agreements are below. Akio Toyoda, President, Toyota Motor Corporation and Kazuhiro Tsuga, President, Panasonic Corporation. 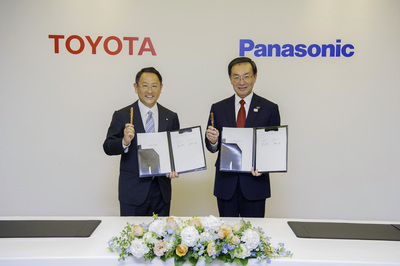 • Toyota and Panasonic will establish a joint venture (pending approval from the competition-law authorities in the countries and regions concerned) by the end of 2020. • The ratio of equity participation in the joint venture will be 51 percent for Toyota and 49 percent for Panasonic. • The scope of the joint venture's business operations will cover research, development, production engineering, manufacturing, procurement, order receipt, and management related to automotive prismatic lithium-ion batteries, solid-state batteries, and next-generation batteries. • Toyota will transfer equipment and personnel to the joint venture in the areas of development and production engineering related to battery cells. Panasonic will transfer equipment, other assets, liabilities, personnel, and other items to the joint venture in the areas of development, production engineering, manufacturing (at plants in Japan and in Dalian, China), procurement, order receipt, and management functions related to the automotive prismatic battery business. • The total number of employees from both companies related to operations subject to transfer to the joint venture is 3,500 (as of the end of December 2018). • Products produced by the joint venture will be sold to various automakers through, in principle, Panasonic. In addition to changes in consumer needs for the automobile, as evidenced by such shifts as those toward connected vehicles, autonomous driving, and car-sharing services, today's automotive world is also being called on by society to help find solutions to such issues as those related to global warming, resources, and energy. As vehicle electrification accelerates toward the solving of such environmental issues, batteries are a most-important element. However, numerous battery-related challenges must be tackled, including not only having advanced technological capabilities to address issues of cost, energy density, charging time, and safety, but also being able to ensure stable supply capacity and having effective recycling structures. The business environment is one in which independent efforts by battery manufacturers or automobile manufacturers are not enough for solving the issues concerned. Against the backdrop of such a business environment, Toyota and Panasonic announced on Dec. 13, 2017 an agreement to study the feasibility of a joint automotive prismatic battery business. Since then, the two companies have achieved high-capacity and high-output automotive prismatic batteries that lead the industry in terms of both performance and cost. To contribute to the popularization of Toyota's and other automakers' electrified vehicles, Toyota and Panasonic have also repeatedly held earnest discussions on the concrete details of their collaboration. 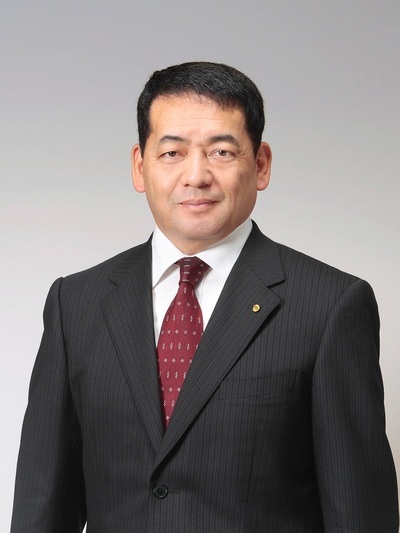 Toyota Executive Vice President Shigeki Terashi. 3) a customer base both in Japan and overseas. In this way, the joint venture aims to become the leader in battery-development and battery-manufacturing capabilities. Specifically, for the joint venture to become the leader in battery-development capability, Toyota and Panasonic intend to coordinate with each other from the vehicle planning and conception stage, and promote the acceleration of high-capacity and high-output battery development. 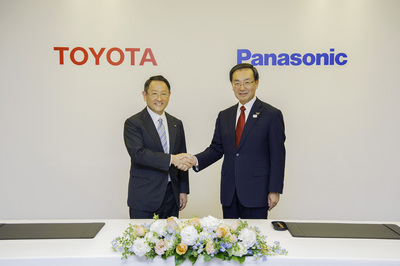 For the joint venture to become the leader in battery-manufacturing capability, Toyota and Panasonic intend to share with each other their production-engineering resources and monozukuri know-how, and, in addition to establishing a high-quality, low-cost, stable supply structure, they plan to also, among other efforts, leverage merits of scale related to procurement and manufacturing costs. "Together with Panasonic, we want to hone our competitiveness in batteries, which represent one of the core technologies of electrified vehicles. By contributing to the popularization of Toyota's and other automakers' electrified vehicles, we want to help find solutions to issues such as global warming, environment-related challenges, and energy-related challenges. We have high expectations for the new company, including - as we aim to deliver ever-better electrified vehicles to even more customers - its role in fulfilling our plans for the popularization of electrified vehicles (including achieving Toyota annual global sales of more than 5.5 million units of electrified vehicles), which we announced at the end of 2017." Panasonic Senior Managing Executive Officer Masahisa Shibata. "Uniting with Toyota's battery and production-engineering technologies provides us an excellent opportunity for being able to evolve our automotive prismatic batteries, which have an established track record of performance and safety, faster than ever. Through the electrification of vehicles, we want to accelerate our contribution to the realization of a society of mobility that is kind to the environment."